Because of budget constraints, Legal Services Corporation-funded programs anticipate laying off 393 employees, including 163 attorneys, in 2012, a survey conducted by LSC found. The reductions continue a staffing downturn that began about a year ago. 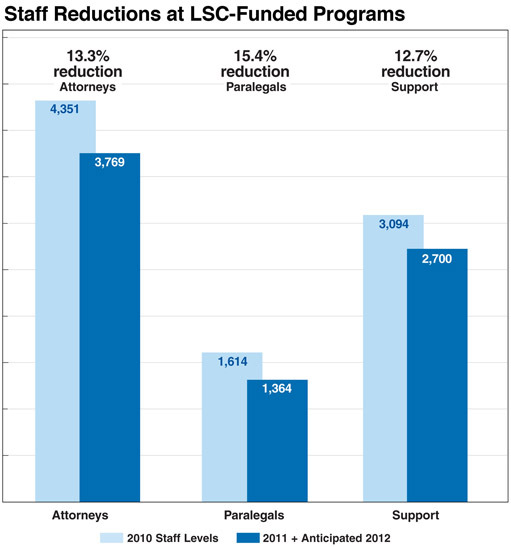 In December 2010, LSC-funded programs employed 4,351 attorneys, 1,614 paralegals and 3,094 support staff. During 2011, LSC programs reduced their staffing by 833 positions through layoffs and attrition. They now anticipate a new round of layoffs this year, bringing the staffing loss to 1,226 full-time personnel. The survey was conducted in late December and early January, and 132 of the 135 nonprofit legal aid programs funded by LSC responded. LSC-funded programs have experienced a decline in LSC and state grants, funds from Interest on Lawyers’ Trust Accounts (IOLTA), and other revenue sources over the last two years. LSC—the nation’s single largest funder of civil legal assistance—received $348 million from Congress for Fiscal Year 2012, down from $420 million in Fiscal Year 2010. Pepperdine School of Law Dean Deanell Reece Tacha, former Chief Judge of the United States Court of Appeals for the Tenth Circuit, was the keynote speaker at the Board’s January 20 luncheon. In her speech, she called on the legal profession to develop new opportunities for law students and the next generation of practitioners to address the legal needs of increasing numbers of Americans. 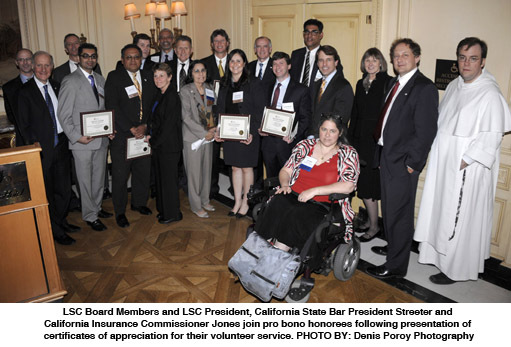 The Board also honored pro bono volunteers at LSC-funded programs in California at a reception on January 19. Dave Jones, Insurance Commissioner for the State of California; Jon B. Streeter, President of the State Bar of California; and John G. Levi, Chairman of the LSC Board spoke at the reception. Mr. Jones began his career as a legal aid attorney with Legal Services of Northern California. Mr. Streeter is a Partner at Keker & Van Nest LLP in San Francisco and chairs the firm’s pro bono committee and has long maintained an active pro bono docket of his own. Board members began their meeting agenda with a trip to an office of the Legal Aid Society of San Diego, where Executive Director Greg Knoll, Managing Attorney Dennis Holz, Pro Bono Program Manager Sara Raffer and Senior Attorney for the Community Response Team Joyce Akasaka briefed the Board on the program’s success with a new telephone hotline system that tracks and speeds calls from people seeking assistance to lawyers and paralegals. The telephone system logs about 65,000 calls per year, up from about 50,000 annually in previous years, an increase that partially reflects the economic downturn, Mr. Knoll said. The following day, January 20, the LSC Board received a presentation on the work of LSC grantees in California that was moderated by Mr. Knoll. He was joined by Silvia Argueta, Executive Director of the Legal Aid Foundation of Los Angeles; Gary Smith, Executive Director of Legal Services of Northern California; Yvonne Mariajimenez, Deputy Director at Neighborhood Legal Services of Los Angeles County; Devon Lomayesva, Executive Director of California Indian Legal Services, and Haydee Alfonso, Managing Attorney at Bay Area Legal Aid. The Board and California program representatives also discussed the role of technology in providing self-help information to unrepresented litigants. Glenn Rawdon, who heads the Technology Initiative Grants program at LSC, moderated the discussion. Panel members were Irene Morales, Executive Director of Inland Counties Legal Services; Chris Schneider, Executive Director of Central California Legal Services; Bob Cohen, Executive Director of Legal Aid Society of Orange County; Ms. Argueta and Ms. Alfonso. A highlight of the Board’s meeting was a briefing on the pilot projects authorized in 2009 by the Sargent Shriver Civil Counsel Act. Each project is a partnership comprising a lead legal services nonprofit corporation, the court, and other legal services providers in the community. The projects target cases involving critical legal issues that affect basic human needs such as housing, custody, conservatorship, and guardianship. In these kinds of disputes, low-income litigants are, for the most part, unrepresented—and often unaware of the various options open to them. The pilots target cases in which one side is represented by a lawyer and the other is not. The pilot projects seek to address the substantial inequities in timely and effective access to justice that often arise because of the complexity of law or because of disparities between parties in language proficiency, legal representation and access to self-help and alternative dispute resolution services. Funding for the projects began on July 1, 2011. The Judicial Council of California will conduct a study to demonstrate the effectiveness and continued need for the pilots and report findings and recommendations to the governor and the California legislature by January 31, 2016. Neighborhood Legal Services of Los Angeles County and the Legal Aid Foundation of Los Angeles are part of a collaboration of Los Angeles legal services programs that will provide representation for 5,000 unlawful detainer litigants with cases in the city’s downtown courthouse. The project will develop innovative policies to encourage early resolution of cases through mandatory mediation or court-supervised settlement conferences. The project also will create an expanded companion pro bono effort to bring in a cadre of new volunteers from large Los Angeles law firms to assist with representation of tenants in unlawful detainer cases and aid in negotiating settlements. The Legal Aid Society of San Diego also will provide representation for all eligible unlawful detainer litigants in the Central Division of the San Diego Superior Court. The LSC-funded program, in partnership with the San Diego Volunteer Lawyer Project, will create a child-custody advocacy staff for matters where sole custody and visitation are sought and the other side is represented by counsel. The Shriver housing project undertaken by Greater Bakersfield Legal Assistance will bring mediation into the picture much sooner—often before a lawsuit is filed—by informing litigants and potential litigants of the availability of no-cost early dispute resolution. The project will explain the unlawful detainer process in terms that lay persons can understand, and will encourage early dispute resolution in all cases, including mediation by neutrals with specialized unlawful detainer training. The project also will provide representation by counsel when the other party is already represented by counsel. Legal Services of Northern California will launch one urban and one rural project to provide attorneys to more than 1,000 defendants in eviction actions annually. The project’s attorneys also will update and expand self-help material available to unrepresented litigants and work with the courts to provide new e-filing services for tenants. In another session, the Board welcomed Dr. Robert Ross, President and Chief Executive Officer of The California Endowment, who provided an overview of the Endowment’s efforts to build healthy communities in 14 geographically diverse communities throughout California. The Endowment is a funder of the Consumer Center for Health Education and Advocacy, which assists people in navigating San Diego County’s health care systems. The Consumer Center also receives support from the Legal Aid Society of San Diego. It its annual business meeting, the Board reelected Chairman John Levi and Vice-chair Martha Minow. The Legal Services Corporation held its 12th annual Technology Initiatives Grant (TIG) Conference in Albuquerque, NM, January 11-12, 2012. The conference brought together 123 representatives from programs that received 2011 TIG awards, along with participants from other legal aid programs (both LSC-funded and non), bar associations, courts, and both for-profit and nonprofit technology companies. LSC President James J. Sandman participated in the conference, and in a luncheon address spoke about the increasingly critical role of technology in leveraging resources and increasing access, particularly at a time when funding cuts require programs to do more with less. He praised the innovative work of LSC’s grantees, thanked those leading technology initiatives in their programs, and said that, going forward, LSC will work to broaden the adoption of technologies proven to expand access and improve the efficiency and effectiveness of the provision of legal services. Stephanie L. Kimbro, Esq., a recognized thought leader on ethics and technology issues in delivering legal services online, spoke on “Going Virtual to Expand Access.” She discussed the trend toward unbundling legal services (in which an attorney and client agree that the attorney will provide some but not all of the work involved in traditional full-service representation), the increasing number of virtual law offices, and how these trends can provide opportunities for the delivery of legal aid. Ms. Kimbro proposed ways of using technology to close the justice gap, including the possible adoption of secure client portals and online delivery methods by local and state legal aid offices. She also suggested that these trends offer opportunities for expanded collaboration between legal services programs and volunteer attorneys. Because they are already set up to practice online, she said, private attorneys in virtual practices are ideally situated to assist pro bono clients remotely and provide unbundled services. Read materials related to Stephanie Kimbro’s presentation. Following the plenary, Ms. Kimbro was (virtually) joined by Marc Lauritsen, President of Capstone Practice Systems and co-chair of the American Bar Association's eLawyering Task Force, for a break-out session that allowed participants to further discuss the issues and ideas raised in her speech. On Thursday, Ed Smythe, who in his role at Gartner, Inc. advises law firms on their Information Technology strategies, presented a plenary session on “Technology Trends You Can’t Afford to Ignore.” The trends Smythe identified included Virtualization, Big Data, Energy Efficiency, Staffing, Social Media and Cloud Computing. He also led a break-out session on IT Strategy. A mini-track on “Intake, Triage, and Technology” looked at how legal services programs and the courts evaluate requests for assistance to see who gets helped and with what level of assistance, projected how these same systems may look in 10 years (including a perspective on what type of research will be needed to refine the process) and produced a draft set of principles for driving the development of legal services intake and legal problem assessment systems. Presenters included Jim Greiner, Assistant Professor of Law at Harvard Law School; Craige Harrison, Managing Attorney at Utah Legal Services; Bonnie Hough, Managing Attorney for the California Administrative Office of the Courts Center for Families, Children & the Courts; Karen Lash, Senior Counsel for Access to Justice at the U.S. Department of Justice; Susan Ledray, Senior Manager for the 4th Judicial District Court (Minneapolis, Minnesota) for Pro Se Services, Family Court, and Domestic Abuse Service Center; and Richard Zorza of the Self-Represented Litigation Network. Other workshop sessions at the conference explored resource-sharing for website content and videos, telephone systems, document management software, website analytics, rural service delivery innovations and challenges, mobile apps and mobile web, IT security practices, next generation A2J software; and breakout sessions for the statewide websites. The TIG team led sessions on Managing Your TIG Effectively, TIG Evaluation Planning, and a 2012 TIG Information session. The 2012 TIG Conference also included a plenary featuring seven quick-fire presentations in the popular Ignite format, where each presenter had 20 slides that automatically advanced every 20 seconds. The presentations addressed topics as varied as project management, search engine optimization, and reentry. One of the most valuable benefits of in-person meetings is the chance for participants to network and learn from each other. To facilitate that, the conference provided time for 14 informal affinity group sessions that attendees helped define at registration. One participant remarked that the Cloud Computing session alone was worth the cost of attending the conference, as it helped her decide to move her organization’s servers to the Cloud to save money and staff time. Read more about the 2012 TIG Conference, including session materials. For the first time, LSC provided 10 scholarships to attend the TIG conference. Any LSC recipient that had never received a TIG award was eligible to apply. The purpose of these scholarships was to encourage programs that have never received a TIG to expand their knowledge and use of technology, and to better enable them to submit successful TIG applications. The scholarship recipients also had an opportunity to meet with LSC President Sandman at the conference. The next TIG Conference is planned for January, 2013. LSC’s Loan Repayment Assistance Program (LRAP) is currently accepting applications for both new and renewing participants. The application period began on Wednesday, February 1 and will remain open until 5pm on Monday, February 27. The Herbert S. Garten LRAP was established in 2005 and is funded by a Congressional appropriation. Through it, LSC makes a limited number of forgivable loans to attorneys employed by its grantees. The goals of the LRAP are to help LSC grantee programs recruit and retain highly qualified attorneys, and to promote the development of initiatives that make public interest law a viable career path for law school graduates. Attorneys who are selected to participate in LSC’s LRAP receive loans of up to $5,600 per year, for up to three years, provided they remain eligible and funding is available. Participating attorneys are expected to remain with an LSC-funded legal services program for three years. Learn more about LSC’s LRAP and apply to participate. The National Association of Law Placement (NALP) is conducting its biennial survey of public interest and government law offices. The survey gathers data on attorney salaries, benefits packages and loan repayment assistance programs. In past years, the data collected for this survey have shown that the average starting salary for civil legal aid lawyers is the lowest in the legal profession, both in the private and public sectors. According to NALP, public interest groups use the data to set salary scales, advocate for expanded loan repayment assistance programs and more. LSC uses the survey to advocate for increased federal funding, and encourages programs to participate. The survey was mailed to public interest organizations throughout the country in mid-January. It is also available online, and as a printable file. Please complete only one version of the survey. The response deadline is February 24, 2012, but NALP asks that participants complete the survey earlier if possible. All survey participants will receive a free electronic copy of the report when it is released later in the year. For more information, contact Steve Grumm, NALP's Director of Public Service Initiatives, at sgrumm@nalp.org or (202) 296-0057. LSC is considering creating additional enforcement mechanisms to improve the Corporation’s ability to provide effective oversight of its grant program. LSC has published a Notice of Proposed Rulemaking (NPRM) proposing changes to LSC’s regulations at 45 C.F.R. Parts 1606, 1618 and 1623 to adopt standards and procedures for limited reductions in funding, to allow for the imposition of Special Grant Conditions during a grant year, and to amend the maximum suspension period from 30 to 90 days. 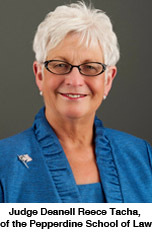 Public comments on the NPRM are due by April 2, 2012. If you have any questions, please contact Mattie Cohan, Senior Assistant General Counsel at: mcohan@lsc.gov or 202-295-1624. Read the NPRM on LSC’s website. The Legal Services Corporation has issued its income eligibility guidelines for 2012, which establish maximum income levels for individuals and families eligible to receive legal assistance from LSC grantees. The LSC Income Guidelines are amended each year to reflect the annual amendments to the Federal Poverty Guidelines as issued by the Department of Health and Human Services. LSC’s guidelines are based on the federal poverty level established annually by the Department of Health and Human Services. In general, those receiving legal assistance from an LSC grantee must live at or below 125 percent of the federal poverty level, which in 2012 is equivalent to $13,963 for an individual and $28,813 for a family of four. “Mrs. Neil,” age 87, had been faithfully paying her mortgage on time every month, she but was about to lose her home to foreclosure when she came to Atlanta Legal Aid for help. Prior to retirement, Mrs. Neil worked in a hospital taking meal orders, as a home health aide providing housekeeping assistance, and then as a babysitter. She lives on a limited income of around $1,000 per month in Social Security, but her bank refinanced her home with something called a “pay option adjustable rate mortgage.” The amount of the monthly payment was not based on repaying the loan. Each month that Mrs. Neil made her full payment on time, she fell further behind on her mortgage because the interest accumulating was greater than the minimum payment, much like a credit card. But Mrs. Neil did not know that. When she came to Legal Aid, she had paid $30,000 toward her mortgage but actually owed $10,000 more than when she took out the loan. Mrs. Neil was a victim of predatory lending, and when confronted with the facts, her bank agreed to accept a short payment of about $50,000 rather than the $160,000 owed. An attorney with the Atlanta Legal Aid Society arranged a reverse mortgage to cover the $50,000, the predatory mortgage is now paid off, and Mrs. Neil will be able to live in her home without making payments for the rest of her life. For people behind on their mortgages and facing possible default and loss of their homes to foreclosure, there is still hope, although the fight to save a home can be long and frustrating. A major funder of legal services for the poor will shave its grants by at least 5 percent across Maryland — even after dipping into its reserves. Facing deep funding cuts, Central Virginia Legal Aid will continue its focus on helping victims of domestic violence but, without additional resources, will have to turn away clients who need help with child custody and child support. Working together, Virginia legal services programs, private attorneys and Capital One Financial Corp., are developing a powerful tool to streamline pro bono and improve client service. Budget cuts will force Legal Services of South Central Michigan to cut staff and services unless replacement funding is found. Budget cuts have already resulted in staff cuts at Mid-Missouri Legal Services Corporation, which has experienced a 60 percent increase in its caseload since 2008. With the help of Neighborhood Legal Services of Los Angeles County, minority residents of Antelope Valley public housing stand up to harassment and bring about change.